Difference between revisions of "Vogt, David D. (1907-1994)"
The sudden death of father-in-law Kornelius Neufeld in 1945 led them to sell the farm and fulfill David’s dream of continuing his education by going to [[Mennonite Brethren Bible College (Winnipeg, Manitoba, Canada)|Mennonite Brethren Bible College]] in 1946. Two more happy years followed, at the College, in the [[Elmwood Mennonite Brethren Church (Winnipeg, Manitoba, Canada)|North End Mennonite Brethren Church]], in private school for the two oldest girls, and with the profound musical influence of [[Horch, Ben (1907-1992)|Ben]] and [[Horch, Esther Hiebert (1909-1994)|Esther Horch]], as well as Emmanuel and Agatha Horch. The disastrous Fraser River flood of 1948 brought the family back to British Columbia, where they had a small property in [[Greendale (Chilliwack, British Columbia, Canada)|Greendale]]. After one year, they moved to Vancouver. While working full-time in the furniture business, David, ably supported by his wife Agatha, once again became very active in church work. He was on the Steering Committee of the <em>Mädchenheim</em> ([[Bethel Girls' Home (Vancouver, British Columbia, Canada)|Bethel Girls’ Home]]) in Vancouver. He was elected Sunday School Superintendent of the [[South Hill Mennonite Brethren Church (Vancouver, British Columbia, Canada)|Vancouver Mennonite Brethren Church]], and also served as Assistant to the Pastor. When that church was no longer large enough, he was elected interim leader of the new [[Fraserview Mennonite Brethren Church (Richmond, British Columbia, Canada)|Fraserview MB Church]]. A part of his commission was to find a full-time pastor, which he did with the appointment of [[Toews, Peter Reginald "P. R." (1916-2005)|Peter R. Toews]]. David also served on the Board of the Union Gospel Mission in downtown Vancouver for many years. The disastrous Fraser River flood of 1948 brought the family back to British Columbia, where they had a small property in [[Greendale (Chilliwack, British Columbia, Canada)|Greendale]]. After one year, they moved to Vancouver. While working full-time in the furniture business, David, ably supported by his wife Agatha, once again became very active in church work. He was on the Steering Committee of the <em>Mädchenheim</em> ([[Bethel Girls' Home (Vancouver, British Columbia, Canada)|Bethel Girls’ Home]]) in Vancouver. He was elected Sunday School Superintendent of the [[Vancouver Mennonite Brethren Church (Vancouver, British Columbia, Canada)|Vancouver Mennonite Brethren Church]], and also served as Assistant to the Pastor. When that church was no longer large enough, he was elected interim leader of the new [[Fraserview Mennonite Brethren Church (Richmond, British Columbia, Canada)|Fraserview MB Church]]. A part of his commission was to find a full-time pastor, which he did with the appointment of [[Toews, Peter Reginald "P. R." (1916-2005)|Peter R. Toews]]. David also served on the Board of the Union Gospel Mission in downtown Vancouver for many years. The family subsequently transferred their membership to the [[Culloden Mennonite Brethren Church (Vancouver, British Columbia, Canada)|Culloden MB Church]], where they worshipped and continued their work as deacons for 4 years. Their final move was to the Clearbrook Mennonite Brethren Church in 1984. Here they once again managed an apartment, which they had also done when David retired from the furniture business. They continued their work in the [[Clearbrook Mennonite Brethren Church (Abbotsford, British Columbia, Canada)|Clearbrook MB Church]] as deacons, with frequent hospital visitation. For this, they were richly rewarded with many visits, when they themselves became ill.
David D. Vogt: farmer, warehouse manager, churchman; born 24 March 1907 in Friedensfeld, South Russia. His parents were David Heinrich Vogt (1880-1921) and Maria (Thielman) Vogt (1878-1942). Their oldest son died but 2 sisters and David and his younger brother survived. David married Agatha Neufeld (27 April 1907, Friedensfeld, South Russia – 23 August 1996, Abbotsford, British Columbia, Canada) on 30 March 1930 in Yarrow, British Columbia and they had four children, Irene, Eleanore, Victor, and Viola. David died 7 July 1994 in Abbotsford, where he was buried. Soon after his wealthy father, a grain miller, mysteriously disappeared while on a business trip in 1921, David decided to immigrate to Canada, in order to continue studying. He hoped, ultimately, to return to Russia to marry Agatha Neufeld, the youngest daughter of Kornelius and Susanna Neufeld. With political conditions steadily worsening in Russia, this plan was thwarted. However, Agatha Neufeld and her parents miraculously escaped from the Soviet Union, leaving for Canada in 1929, to join other members of the family. 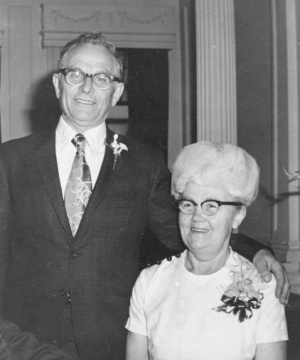 David and Agatha were married in Yarrow, British Columbia in 1930 and worked hard to establish a farm with the Neufelds, who lived on the same property. These were some of the most-fulfilling years of the family’s life with much productive labor, involvement in the church and music-making. They became charter members of the Sardis (Greendale) Mennonite Brethren (MB) Church. The sudden death of father-in-law Kornelius Neufeld in 1945 led them to sell the farm and fulfill David’s dream of continuing his education by going to Mennonite Brethren Bible College in 1946. Two more happy years followed, at the College, in the North End Mennonite Brethren Church, in private school for the two oldest girls, and with the profound musical influence of Ben and Esther Horch, as well as Emmanuel and Agatha Horch. The disastrous Fraser River flood of 1948 brought the family back to British Columbia, where they had a small property in Greendale. After one year, they moved to Vancouver. While working full-time in the furniture business, David, ably supported by his wife Agatha, once again became very active in church work. He was on the Steering Committee of the Mädchenheim (Bethel Girls’ Home) in Vancouver. He was elected Sunday School Superintendent of the Vancouver Mennonite Brethren Church, and also served as Assistant to the Pastor. When that church was no longer large enough, he was elected interim leader of the new Fraserview MB Church. A part of his commission was to find a full-time pastor, which he did with the appointment of Peter R. Toews. David also served on the Board of the Union Gospel Mission in downtown Vancouver for many years. The family subsequently transferred their membership to the Culloden MB Church, where they worshipped and continued their work as deacons for 4 years. Their final move was to the Clearbrook Mennonite Brethren Church in 1984. Here they once again managed an apartment, which they had also done when David retired from the furniture business. They continued their work in the Clearbrook MB Church as deacons, with frequent hospital visitation. For this, they were richly rewarded with many visits, when they themselves became ill.
David and Agatha Vogt strove to maintain a Christian household, as well as to serve the Lord and their fellow Christians. “Lebenslauf von Agathe Vogt (geborne Neufeld)” Mennonite Historical Society of BC Archives. “Life History of David D. Vogt” Mennonite Historical Society of BC Archives. Mennonite Brethren Herald (16 September 1994). Vogt, Victor. "Vogt, David D. (1907-1994)." Global Anabaptist Mennonite Encyclopedia Online. December 2009. Web. 23 Apr 2019. http://gameo.org/index.php?title=Vogt,_David_D._(1907-1994)&oldid=132524. Vogt, Victor. (December 2009). Vogt, David D. (1907-1994). Global Anabaptist Mennonite Encyclopedia Online. Retrieved 23 April 2019, from http://gameo.org/index.php?title=Vogt,_David_D._(1907-1994)&oldid=132524.